Nelda Bachle Moffatt was born in Austin, Texas (1925), while her father worked on a PHD in education. She is a second generation American, since her mother was born in Berlin, Germany. Her parents and grandparents provided a European viewpoint, even in the hinterlands of Texas, along with a love of history. When her sons took history in Junior High School, she felt they needed an over-arching framework on which to hang everything they learned. She vaguely saw that the basis of the framework was the Bible and Christianity along with man’s fund of knowledge. She felt a ‘duty’. But when she grasped the enormity of the task, she explained to God that no one person could do it. And IF one could, she was the very last person…’Nevertheless’ was the answer that came back to her. God knew all of that. Besides, God always uses the most unlikely person, so we know that the work is ALL His. Books fell into her hands at just the right time as she browsed book stores, libraries, even books from her son’s Plan II courses at UT. 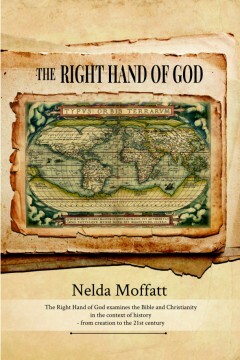 After thirty years of study, plus insightful experiences over most of the 20th C, the result is The Right Hand of God. As the cover states, it examines the Bible and Christianity in the context of history – from creation to the 21st C. Did it succeed?